Surf class, summer of 2017. I’ve always been uncomfortable calling surfing a sport. Still, I would never go so far as to call it a “religious experience,” even though I have had some deeply spiritual moments while drifting over the ocean. So, if surfing is not a sport or a religion; what exactly is it? Maybe the Beach Boys, most of whom didn’t surf, actually had it right when they called it a way, or more accurately, “the only way.” Now, I know that leans toward religion, specifically Taoism, but surfing being a way is perhaps the most accurate category for this thing that has held many of us captive for, in the case of some readers, over half a century. Surfing as a way (of life) makes sense because there is far more to the surfing life than the act of riding waves. In fact, riding a wave constitutes a fraction of the surfer’s existence and most of the time even the most avid surfers are out of the water. So, what does it mean to be a surfer? For starters, it means being in touch with the natural rhythms of life. Now, you could argue that there are those who surf in wave pools, or rely on their cell phones to know when the surf is good, but there are others who are as tuned into the natural rhythms of life as migrating geese. Anyone who has ever spent a month or more camping deep in Baja or other remote oceanic locations knows about moon, sun and tide cycles. Even without the easy access of online surf reports these surfers know what swell size and direction and what tides certain breaks work best on. They can predict when winds are favorable or unfavorable, and know the secrets to subtle bends in the coast that will produce good surf when all of the surrounding spots are either blown out or flat. Anyone who adapts the surfer’s way quickly learns that the natural elements are far more powerful than they are, and that they cannot be conquered. They know not to work against a wave, but with it, since even the smallest swells can push them aside so yesterday’s newspaper. Lifelong surfers tend to adapt different values in life than the mainstream. Few of them are materialistic, unless you count surfboards and surf spots as material. They are generally early to bed, ecologically informed and know more about the beaches they walk on than anyone else. Many of them can tell you about the fossilized reefs and what caused them to appear millennia ago. They know when it will rain before the weather anchor ever says a word. If I had it to do over again, I would choose the surfer’s way. It has been a good guide to health and happiness and produced lifelong friendships. 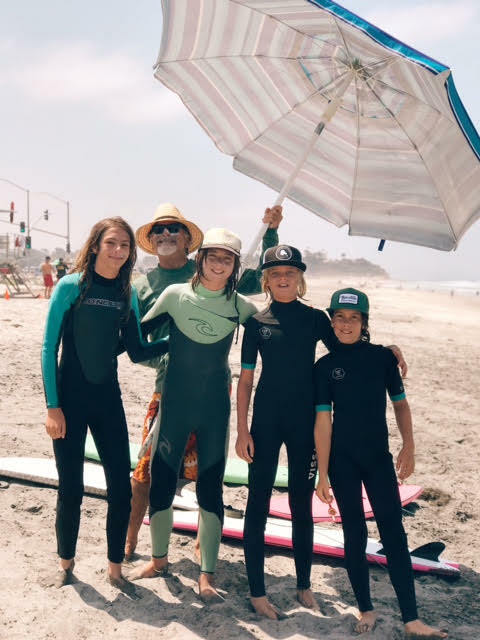 I encourage parents to involve their children in the surfer’s way — not only to push them into waves, but also to involve them in the wonders that are all around them. Of course there are possible hazards involved like skin cancer, stingrays, not learning to be being good team players and maybe dropping out of college to be close to the surf. On the other hand, the lessons learned in the ocean — the firsthand encounters with everything from sand crabs and dolphins to sharks — the self-reliance and the ability to think for one’s self can be taught in few other ways. I probably don’t need to mention that riding a wave is one of the greatest experiences a human being can ever enjoy. For those and many other reasons, I see surfing as something more than a sport, and less than a religion. It’s a way; and while I might lose my way occasionally, I always return to it eventually.